The Steve Jellen Library houses a collection of over 300 donated books on piano tuning, repair, design and manufacturing, as well as related topics. Many of these books came from the library of William Braid White, which was purchased by Fred Odenheimer from White's estate, and donated to the Foundation in 1993. William Braid White was responsible for founding both the National Association of Piano Tuners (in 1910) and the American Society of Piano Tuner-Technicians (in 1941). Those two organizations merged in 1957 to form the Piano Technicians Guild. 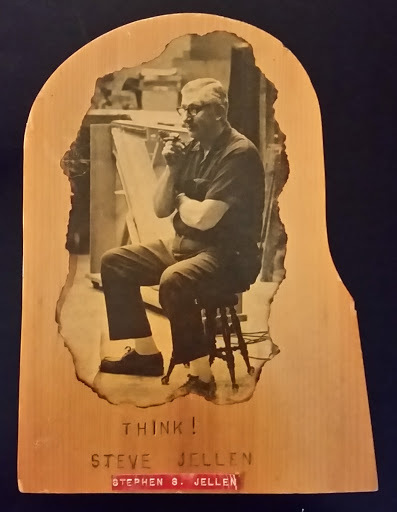 Stephen S. Jellen (1917-1977), after whom the library was named, was a long time Piano Technicians Guild member, and was very active in the organization. Largely self-taught, he had the unusual dream of becoming a piano maker, and constructed over 40 upright pianos during the course of his career. He also did considerable rebuilding work, and was one of the first members of PTG to construct and install new soundboards. In later years, he served as chief trouble-shooter for the Pratt Read action manufacturing company. The plaque below and the accompanying text were presented to the Foundation by Wally Brooks in October, 2016. They are hanging in the Museum now. Steve was my mentor and friend. He taught me many rebuilding skills, including sounding board and pin block replacement. Steve had built 42 high quality console pianos with the ‘Jellen’ name and he had replaced more than 200 grand piano sounding boards. He was one of a few great piano men at the time that were very open with their knowledge and willingness to pass it on to new technicians. One day I got a call from Steve that he was coming my way and wanted to stop by to see me. When he showed up I could tell he was in a down mood. He was carrying a piece of finished sounding board with ribs attached. He took a seat and told me the story of that piece. After successfully installing more than 150 replacement boards, this last one did not go so well. After completely manufacturing the new board and gluing it into the piano, all looked well. Until, he went to install the plate and it came down on some of the bridges! Something had slipped out of place or he was not thinking clearly when replacing the bridges. The only proper repair was to remove the board and start over. His words to me were, “Always think when doing soundboard or any other piano work.” He presented the piece of soundboard from his mistake. Steve passed away in 1977 at the age of 60 from cancer. The Piano Technicians Guild memorial is the Steve Jellen Memorial Library. This plaque hung in my shop for more than 38 years. I think it fitting that it be a part of the PTG Library that bears his name.